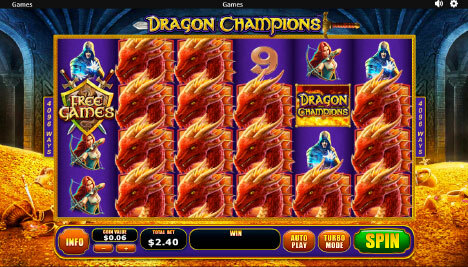 Dragon Champions at Fly Casino is a wonderful new 6-reel, 4,096 ways to win slot. Similar to the popular Buffalo Blitz slot, Dragon Champions looks amazing at Fly Casino as mythical dragons and heroic champions await you in this fantasy-world themed game. There’s a randomly triggered Dragon fire feature in the base game where any symbol that lands with blue Dragon fire symbol will expand in up to 4 directions that can give you massive wins. This feature also plays in the Dragon Champions Free Games feature. The Dragon Champions Free Games bonus feature is triggered when you get three or more Free Games scatters anywhere across the reels. Three scatters will reward you with eight free spins. Four gives you 15 free spins. If you get five, you will play with 25 free spins. If you get six, you will receive an absurd 100 free spins! Play it this weekend: Hint, free spins are available, see below promotions! 77% Bonus up to 144.00! On Sunday from 00:00GMT until 23:59 GMT, all members will receive a 77% bonus up to 144.00 on your deposits of $/£/€30 or more. $266.00 Big Money Tuesday! From 00:00GMT until 23:59 GMT, all members are invited to receive a 133% bonus up to $/£/€266.00 on your deposit of just $/£/€30 or more or more.